Download your own space odyssey today! 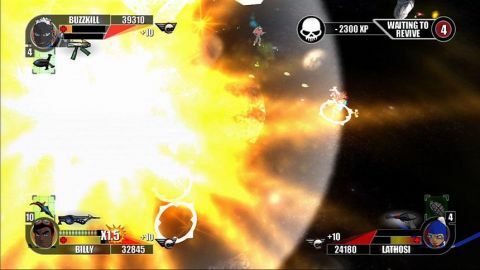 Rocketmen: Axis of Evil is a viewed-from-above, cartoonish shooter about a daring space warrior (you) who is part of a rebellion against a Martian empire. With your partners, you'll make life difficult for the green guys. Naturally, there will be many explosions. Gameplay is simple and familiar. The left analog stick controls movement and the right one directs shots. Shoulder buttons activate and cycle through special weapons. It's also possible to obtain special firearms that briefly enhance your shots before fading and leaving you with your standard pistol again. Experienced players will quickly learn to make the most of each weapon as long as they have it, because otherwise things can get hectic pretty fast. Though early stages offer little resistance, they take awhile to slog through just because you're so under-powered. It's impossible to actually die, but there are delays before you can return to the action after collapsing. The experience points you gain for your efforts also diminish each time you bite the dust. In a way, the worse you are at the game, the more it punishes you for playing (since helpful upgrades take that much longer to obtain). Later, when you revisit areas with a beefed up warrior, you'll marvel at how simple the stages have become. Graphics and sound are sufficient but seldom excel. As you work through it, the narrative unfolds in animated panels that feel almost like they were torn from a 50s-era comic book. The artwork is solid, with good attention to detail when it comes to facial expressions and bosoms. You'll see numerous shots of both, since the developers remembered never to take themselves too seriously. Actual levels don't always fare as well, with occasional delays on-screen when things grow especially frenzied, but the environments in general look acceptable. Description This online shooter promises four player action based on a popular constructable strategy game.